In the process of synthesizing a protein capable of curing any genetic ailments, two geneticists engineer a humanoid creature and test the limits of the law and morality in the name of science. The trailers for Splice were so atmospheric and creepy that they gave me chills, and anyone who knows me knows that I don't dig on horror movies at all, but Splice looked new and different and genuinely terrifying, so I gave it a shot. Oops. 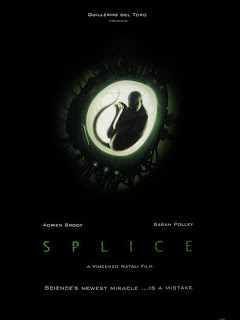 Up until the last 15 minutes or so, Splice isn't a bad film, it's a mediocre one. But once the "twists" start taking place, the ridiculous meter just keeps climbing until it breaks through the ceiling like the Wonkavator. The film starts out kind of slow and uninteresting and then gives us a glimmer of hope towards the middle, and then immediately decides that being interesting is overrated. Also, this is the first time I have been so confused by costuming in a film. All of these brilliant scientists spend the film looking like they came out the wrong end of a riot in Urban Outfitters. It's like a lab run by youth pastors or something. I couldn't take characters that are supposed to be geniuses seriously if they're wearing a shirt with some pithy saying on it. It just looked awkward. On the pros list, director Vincenzo Natali serves up some atmospheric visuals, but never really plays with them outside of the film already being moody given the subject matter. Adrien Brody turns in a decent performance, but is a little too funny in the role, once again not allowing me to take him seriously. Unfortunately, the film subscribes to far too many "science gone wrong" cliches for its own good, leaving gaping plot holes everywhere and simple fixes for stupid problems. It doesn't help that Sarah Polley is pretty vacant in her performance. Overall, Splice is a mediocre at best sci-fi/horror film that catapults itself into "begging to be Rifftraxed" territory during the final act. Seriously that business is RIDICULOUS.